You can be assured of a warm Welcome at Mena House which is a 9 bedroom Tudor style residence with antique furnishings and set in an award winning mature garden of roses. 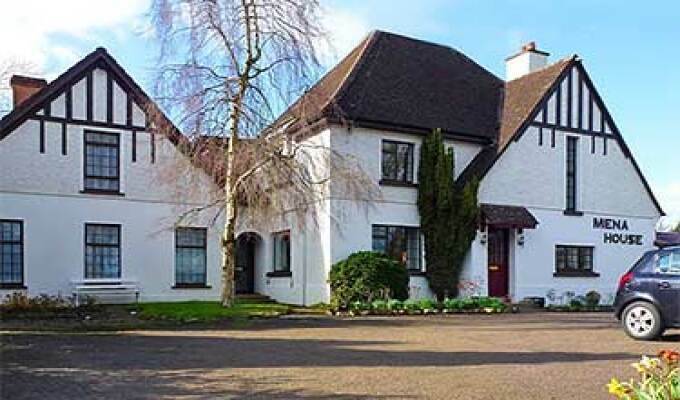 It is ideally located on the N77/78 opposite the Newpark Hotel, 3 minute walk Kilkenny Golf Club,and a brisk 10 minute walk to Kilkenny Medieval City. Among the facilities available for guests are en suite rooms, complimentary tea/coffee, TV along with private car parking. There is also a choice of breakfasts including homemade preserves. Come and stay with us and visit our Medieval City - you wont be disappointed!! Route N77 opposite second entrance to the Newpark Hotel, Kilkenny. I only stayed here for one night, but it was a very comfortable last night of my visit to Ireland. Very pleasant room, excellent breakfast and a host who was very friendly, knowledgeable and helpful. Plus, it's within easy walking distance of the town centre. I'd certainly stay here again. We had a wonderful stay at the Mena House B&B. We were greeted by Katherine who was a warm and enthusiastic hostess. She assisted us with our itinerary and gave us great tips. The breakfast overlooking the gardens was the best that we had in our 2 week stay in Ireland. The rooms were clean, cozy and very comfortable. We hope to return for a longer stay. 5 stars all around!